Over the decades, there are movies produced that act as commentary on the state of politics, socio-economics, and sometimes humanity itself. 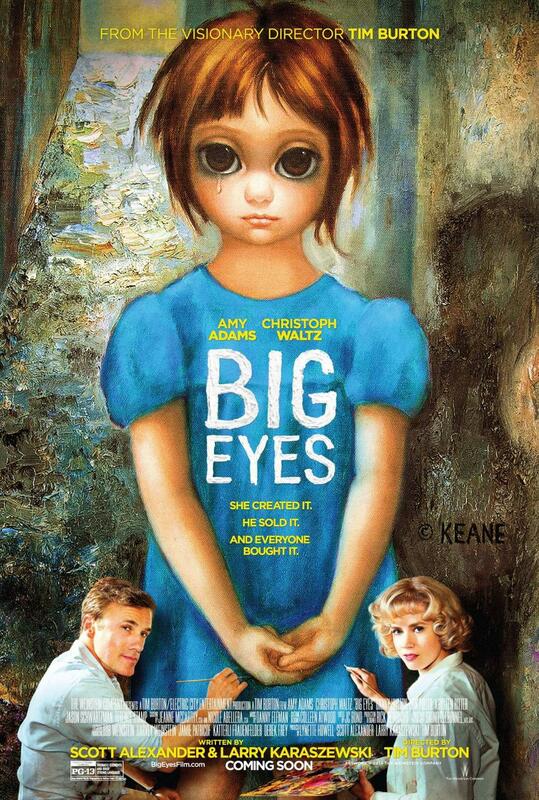 And that is exactly what visionary director Tim Burton has done with the artful film Big Eyes. If you have ever had your creative work stolen by someone else, or taken part in or perpetuated a lie for so long that you begin to believe it yourself, then this is a movie for you! Although not blatantly “Burton” production style, the subtleties of his genius are meticulously woven throughout the film. Amy Adams and Christoph Waltz are brilliant together and genuinely sell their respective characters. For fans of Don’t Trust the B!&@h in Apartment 23, Krysten Ritter makes several cameo appearances that are reminiscent of Chloe. Not a deep story, but this is a narrative that is extremely well executed, funny, and is a testament to authenticity and honesty. For those who have ever felt vulnerable or helpless, then you will likely find inspiration in this film. Based on a true story, the movie Big Eyes depicts the the evolution of one of the most popular art empires during the mid 20th century. “In the late 1950s and early ’60s, artist Walter Keane (Christoph Waltz) achieves unbelievable fame and success with portraits of saucer-eyed waifs. However, no one realizes that his wife, Margaret (Amy Adams), is the real painter behind the brush” (IMDb). A double-edged sword, Walter’s discovery of Margaret’s works would be both a blessing and a curse. Although Margaret is first horrified to learn that Walter is passing off her work as his own, she is too meek to protest too loudly; but she actually helps to perpetuate the lie and even begins to believe it herself. It isn’t until the the Keanes’ marriage comes to an end and a lawsuit follows that the truth finally comes to light. Follow Margaret on a journey that takes her from vulnerable single-mother to protective mother and finally proud artist. When coming to the theatre to watch a Tim Burton film entitled Big Eyes, one might expect that there would be crazy big eyes throughout the film and the production design would reek of abstract impressionism. But, that is definitely not the case with this movie. There is only one scene that reeks of the classic Tim Burton style we have all come to expect most of the time from such a visionary. The overall production design is quite simple and typifies what middle and upper class life was like in the U.S. in the 1950s and 1960s. Everything from the Edward Scissorhands neighborhood in the opening to the retro A-frame house design later on in the film is reminiscent of architecture in the mid 20th century. The use of vibrant colors in the production design helps to set the artistic mood of the narrative. The colors also assist the visual storytelling of the film by matching the mood of various scenes. Probably the best parts of the film are the casting and acting. Adams and Waltz are absolutely perfect for their respective roles. The degree to which Waltz sells his charming, manipulative, manic, psychopathic character is outstanding. There is even a moment in the movie where he totally goes “Jack Torrence” on his wife and step-daughter. This moment is right out of Stanley Kubrick’s The Shining. But, my favorite scene has to be the one in which he is both the defendant and attorney in the court-case that is the center of the movie’s showdown. His antics are crazy, funny, and extremely entertaining. Adams plays her mousy, meek, vulnerable, motherly role with excellence. Although her character lacks the charisma of Walter, she plays her character so convincingly. She possesses the skill to both communicate her acceptance and reluctance to perpetuate the lie that is the crux of the film. Krysten Ritter shines as Margaret Keane’s best friend DeeAnn. She really was the perfect choice for the role that harkens back to her character of Chloe in Apartment 23. All the characters have amazing chemistry on screen, and it truly supports the creative narrative. The movie is also a strong depiction of commentary on humanity in and of itself. It shows the audience how a small and innocent lie can snowball into a lie so large that it is eventually the undoing of an entire empire. Often times, a lie has to be told to cover up a previous lie, and if one does this long enough, one can very well begin to believe the lie to be true and lose sight of reality or the truth. Interestingly though, it is easy to see and understand why Walter does what he does in the film. It can be argued that if he hadn’t stepped in to sell Margaret’s artwork, that she would still be an undiscovered artist underselling her art on the sidewalk. At one point in the movie, it is quite apparent that even with celebrity, Margaret still cannot sell her artwork and is dependent on Walter’s smile, charisma, and brilliant sales mind. I still find myself thinking about character backstories, rationale, and decisions long after the movie is over. Perfect for art lovers and anyone who loves to create, sell, or critique. This movie is a wonderful addition to the list of movies you may want to see this holiday season.